Lake Hendricks is a glacial lake located on the South Dakota-Minnesota border approximately 20 miles northeast of Brookings, South Dakota. The surface area of the lake is 1,534 acres. The contributing watershed area is 31,693 acres. Approximately 80% of the watershed area is in South Dakota, and 20% of the watershed area in Minnesota. Upper Deer Creek drains the major subwatershed, and flows into the southwest end of the lake. Beautiful Lake Hendricks offers ample opportunity for sport and relaxation. Boating, skiing and swimming are popular activities on Lake Hendricks. The quality of the lake has produced summer residents from a wide area. The size of the lake offers room for a variety of activities all year round. In summer, the lake is a popular spot for water sports and great fishing! In Winter, area residents enjoy the annual ice fishing derby and the "Winter Fun Day" activities which include cross country skiing, ice skating and sliding, sleigh rides, and ice cutting demonstrations. Fish found in the lake are Walleye, Northern Pike, Panfish and Bullhead. An enclosed fish cleaning station is near the park and campground area. The South Dakota fishing record for the largest Black Bullhead was caught by Harold Stegner on 6/24/81, 3 lbs. 8 oz. The center features 8 luxuriously appointed guestrooms for over night lodging. 4 singles & 4 doubles. 2 rooms handicap accessible. Continental breakfast. Children welcome, limited pets, no smoking. Lake Hendricks Campground - 507-275-3192 - 30 sites, dump station, electric, water, swimming, boat launch, fish cleaning facilities, shower house, and nature trail. The campgrounds contain a modern comfort station, tables, grills and electric plug-ins and graveled pads. There is plenty of good drinking water and picnic shelters in the near-by park. No reservations are needed for the campground located on County Road 24. Lakeshore development includes 102 lakeside residences, numerous forms, and the city of Hendricks, Minnesota. Other developments include a city park, four public access areas, and a golf course. Hendricks, Minnesota (population 700), is a charming small town located in southwestern Minnesota just one mile from the South Dakota border. The town’s rich history is based on a growing economy centered on agriculture. The town also shares a strong Norwegian heritage celebrating "Syttende Mai" every year, as the whole community celebrates Norwegian Constitution Day. Hendricks is a safe, peaceful, and appealing place to live and work. Hendricks is located in Lincoln County. The county provides a pleasant blend of fertile farmland and prairie. 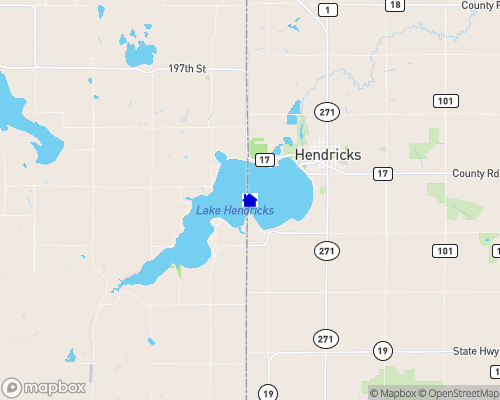 Hendricks is located 90 miles from Sioux Falls, South Dakota and 175 miles from Minneapolis/St. Paul. The economy of the Hendricks area is strong and steady drawing their economic base from agriculture and many small businesses. Its major employer is the Hendricks Community Hospital Association.